Winter is really dragging isn’t it? I’m not sure I can even deal with jumpers, boots and knits any more. I want freedom to wear open toed shoes and walk in the morning sun like it’s only business is to lightly warm my shoulders and breathe it’s cool air on me. I would like an abundance of berries in my markets and light citrus-y, rocket-y, avocado-y salads on my plate. I want haloumi everywhere – don’t tell me I can have it all year, I know, but the lack of aforementioned salads means that my haloumi intake has to lessen over winter. Whilst we are on that haloumi talk… can someone tell me why haloumi isn’t in my laptop dictionary? No? Well then. Okay I’m sorry let’s live in the moment and be joyful for this cloudy, slightly rainy and cold day. For all those moments where the weather is not our friend, I say we instead call this cake our friend; this is the friend that is dependably there for you, the one with the cool jumpers that hugs you like teacosie to its teapot. The friend that understands that any afternoon spent watching pretty in pink, and being mortified at the destruction of that beautiful dress, all the while talking M Ringwald up to goddess status is an afternoon well spent. 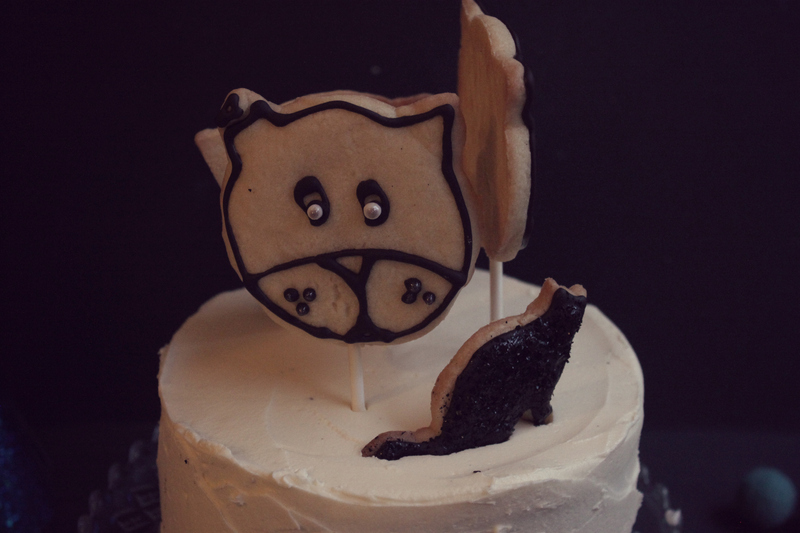 The friend that brings the most chocolatey cake ever to a birthday and even sticks cat cookies on top. Oh wait that last one is me! 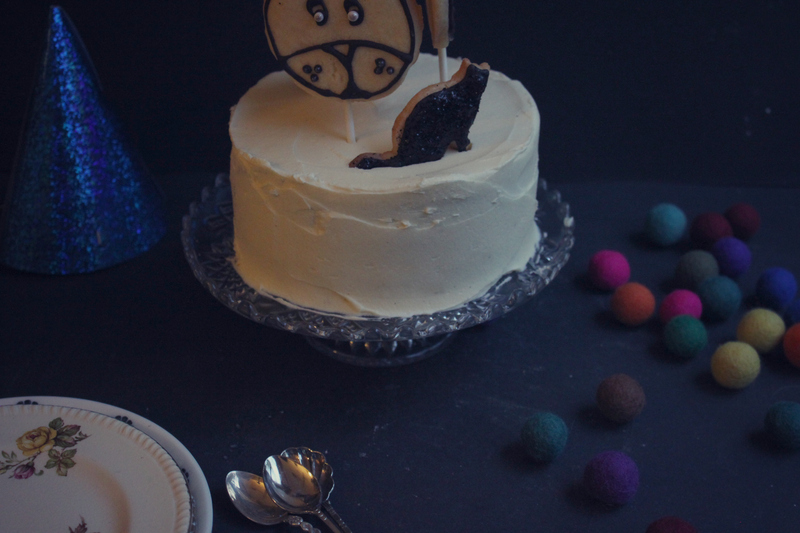 *No animals were harmed in the making of this cake. **except delta, I accidentally fell over her. In other news I’m thinking about going sugar-free due to a prediabetes diagnosis (I was going to do a whole post on it but also I can’t be bothered/I’m not taking life seriously at the moment) has anyone done it before? Any tips? 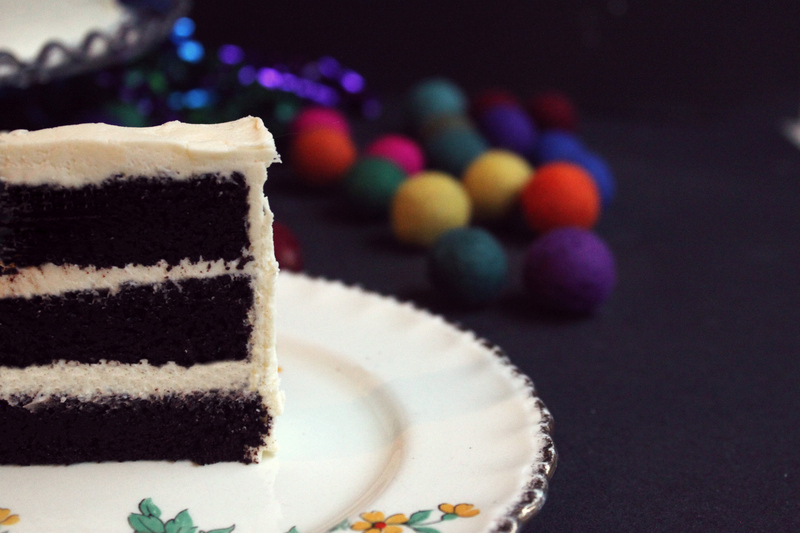 Liberally butter your cake tin, I use a 6″ wide 3″ deep cake tin for all of my cakes; just fyi. Dust the buttered up goodness with cocoa powder and set aside. Pre heat your oven to 180 Celsius. Sieve the flour, cocoa, rising agents and salt together in a bowl, if the salt doesn’t sieve through just chuck it in the mix after, keep the salt. Place the chocolate in a heat proof dish and pour the water over, stir until liquid and leave to cool. Whilst this is cooling mix the milk and yoghurt together with the vanilla extract. Whisk the egg in large bowl until frothy and pale, add the olive oil slowly and keep whisking until the mixture is slightly larger in volume. Add the sugar to this mix and stir through. The chocolate should be cooler at the this point, add this to the egg mixture and stir through. Fold in the milk mixture and then add all the flour mix at once. Fold through until still slightly lumpy. Grab your sieve from before and push the cake mix through the sieve into a bowl; one of the many bowls you will have scattered around your kitchen at this point. Push as much mix through as humanly possible. Get a rubber spatula and scrape the batter into the prepared pan. Place on the middle shelf in the oven and get cleaning on those dishes. You have about 45 minutes. Remove when the cake springs to the touch or a metal skewer comes out clean (I never use wooden skewers). Allow to cool in pan for 40 minutes to an hour, then remove and allow to cool to room temperature. Chill in fridge for at least 2 hours before slicing layers. I used white chocolate frosting from Sweetapolita head over there for that deliciousness. 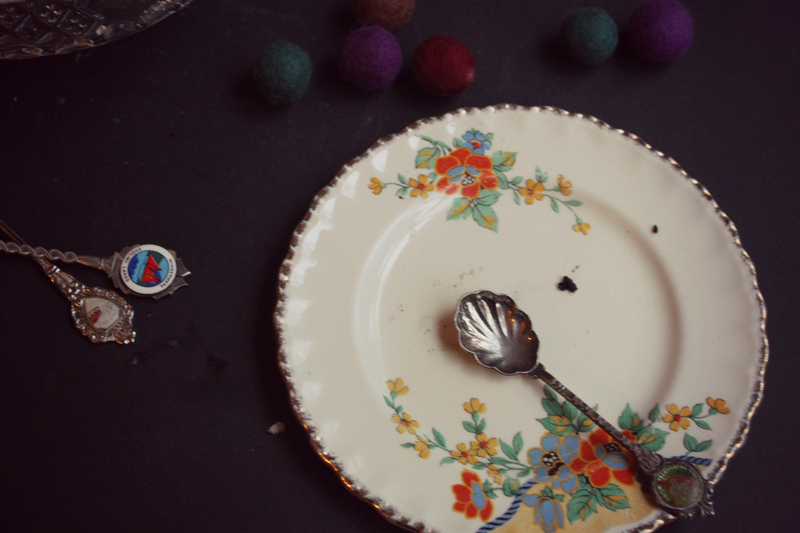 The sugar biscuit recipe will be up next week! Aww, what a cute cake! 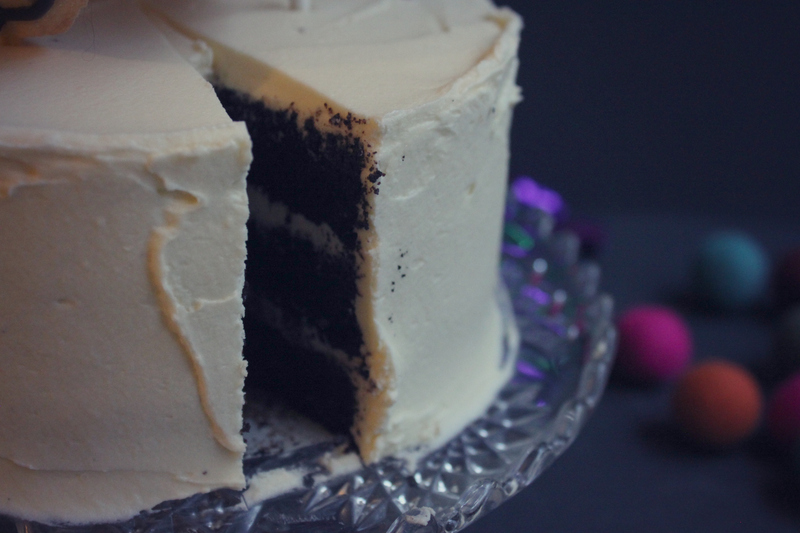 I love the last shot of the sliced into cake, it just looks so wonderfully tall and incredible! This is just too cute. 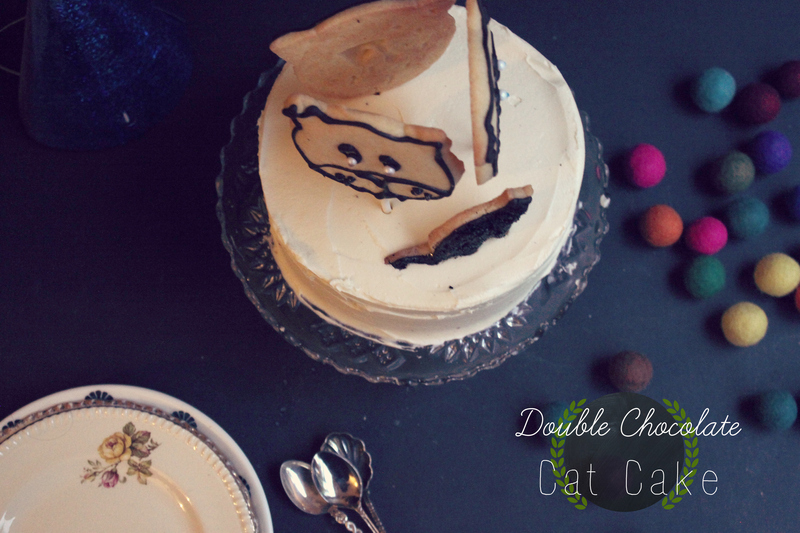 Cats, cake and Pretty in Pink in one blog post? Totally adorable. I know right? I didn’t even realise I was this girly until I re read the post. But here we are in black and white (and technicolour), be right back I just need to reset my curlers and iron my skirt. Actually they are also things I do…damn. I may go and climb a tree!